With a few ingredients this is a simple appetizer or a main entrée – you choose! Lime Avocado Oil by Spicewood Food Company is being used and can be purchased on-line at Spicewood Food Company. If you would like to add a kick to the recipe mix in Spicewood Food Company’s Jalapeño Avocado Oil with the Lime Avocado Oil. The recipe reflects a single serving. Increase amounts to accommodate your desired menu. Remember that these are big, so one for an appetizer or three for an entrée. Lightly season cleaned and dried scallop with a dash of kosher salt and pepper. Heat 1 tablespoon of lime oil or use 1/2 tablespoon of lime oil and 1/2 tablespoon of jalapeño oil in a small skillet over medium high heat. Place scallop in pan with heated olive oil cover and sear for 4 minutes. Turn, cover, and cook for an additional 4 minutes. 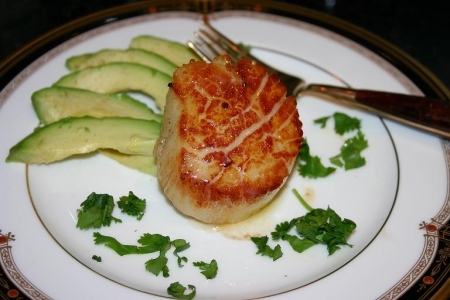 While scallop is searing, fan out sliced avocado onto a small serving dish. Once scallop is cooked, remove from skillet. Place on top of fanned avocado and drizzle with remaining lime and jalapeño oils. Garnish with chopped cilantro leaves. Lightly sprinkle 6-7 granules of kosher salt over the top to make the whole dish pop. The avocado and lime infused oil compliment each other perfectly! Try Salneval Albariño Rίas Baixas Cosecha White Wine Valle Del Salnes (Spain), Schoffit Alsace Chasselas Vieilles Vignes (France), Paulo Alto Reserve (Chile) or a Corona with a wedge of lime.